There are some things from days of past that I just adore. Vintage shoes, china, kids clothes and the art of entertaining. I’ve started selling some of my favorite vintage things on Ebay which is a total digression from this post which is about entertaining. From parties to food, there are some sweet ideas from days of past that deserve to be brought back. For example, a Sip & See to introduce a new baby, the teacup bridal shower, and vintage hors doeuvres like the deviled egg. There is another hors doeuvre warranting attention. Something easy, affordable and flavorful. The Cheeseball! Even typing it makes me giddy. The Cheeseball has been a party staple since the 1920s. According to Better Homes & Gardens “they’re only getting better with age.” I’d have to agree. At my last party, a Rio themed birthday party (details here), I wanted to reintroduce this time honored dish to my circle of friends. With images of the traditional cheeseball from the supermarket, you know the one the nut covered Velveeta cheese concoction, I was dying to flavor it up with quality ingredients. My Google Search resulted in images that were brown, ugly, and with the word Kraft, which just wasn’t what I was going for. After a little digging, I found Martha Stewart’s version which was a nice start. Her beautifully styled pictures gave me inspiration – a cheeseball didn’t have to be brown. It could be green or red and served with complimentary colored crackers. For example, beet chips make the brown cheeseball look more appealing. 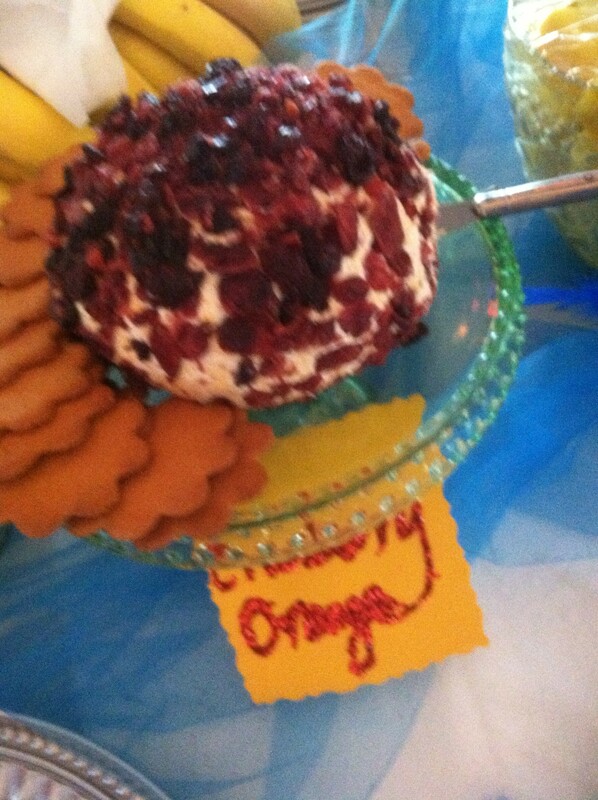 Then, a photo of a pumpkin themed cheeseball from the Food Network really blew my mind. So, I’ll be doing that around Halloween this year. From Martha Stewart’s post, I learned that the base was cream cheese, salt & lemon. To that you can add what you like. I wanted to make two, one sweet and another savory. For savory, I added mushrooms sauteed in butter, Marsala wine, Gruyere cheese and roasted garlic. When that was too bland, I added a half cup of blue cheese. For sweet, I went on a berry and orange theme. So I added a fig & cranberry compote and shredded sharp cheddar. Split into as many portions as you want balls. I decided on two. For the mushroom I added 2 cups of chopped mushrooms sauteed in butter, a tablespoon of bacon fat; 2 tbsp Marsala wine; 1 tbsp roasted garlic, 1/2 cup blue cheese, 1 cup Gruyere. For the cranberry, I added about 1/4 cup of fig & cranberry compote & 2 cups of shredded cheddar cheese. Next time, I think that I’ll add some roasted figs. I might even get really daring and add some prosciutto. Form the final product into a ball – wrap it in plastic wrap and refrigerate. Here’s the trick. To let the flavors marry let them sit overnight in the fridge. Then it is all about presentation. For the mushroom ball, I decided to roll it in scallions and parsley. The textures of which gave it a really pretty effect, sort of like a moss ball you’d see in an English garden. To compliment the green color and salty flavor, I served it with salty yet classic Ritz crackers. I served it on a shiny pewter platter, but next time I’ll use a rustic cutting board. For the cranberry ball, I took another approach. I rolled it in cranberries. When I didn’t have enough (oops), I chopped up some dried cherries to finish it off. The deep dark red of the cherries mixed with the lighter red of the cranberries to provide a beautiful depth. To add elements of sweet and orange, I served it with Anna’s Orange Swedish Cookies. I served it on a vintage cake stand made from green glass from the Depression era (which began my love affair with vintage glassware). The great thing was that the cranberry orange cheeseball also went with the Ritz crackers, so folks could make it more salty of they preferred. 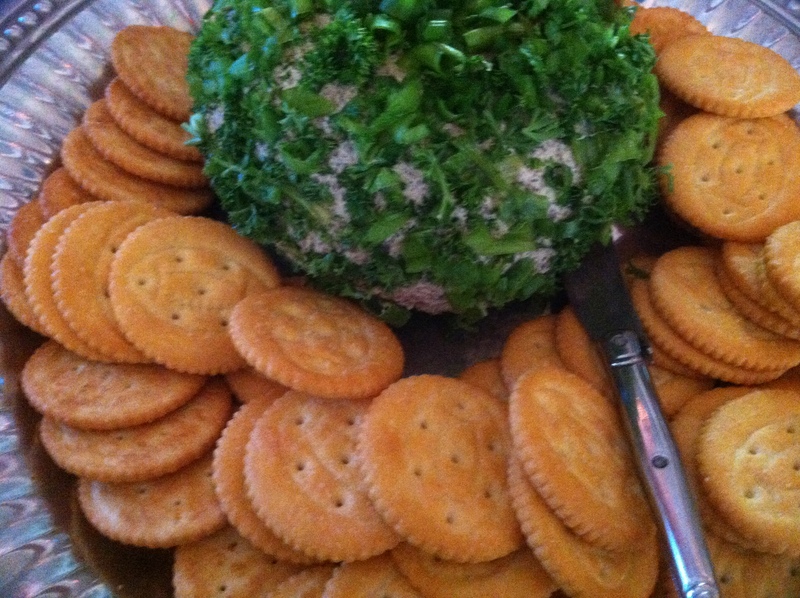 My thoughts are that the cheeseball is a fabulously easy dish to offer at your next gathering. It’s almost too easy! So, yes – it’s time to bring back the CheeseBall. And sorry friends, you’ll be seeing this time and time again. Next time at the MadMen themed cocktail party to raise awareness about the Epilepsy Foundation. Life in the wine country means enjoying lovely food. There are days when unexpected visitors provide a fun excuse to to create a lovely lunch and savor company as well as local flavors. A recent creation of mine is too easy and delicious not to share. A green salad topped with eggs and Gruyere cheese. The perfect compliment to a glass of chilled bubbly! The best part about this recipe is that it is absolutely as simple as can be. The hardest part is literally shaving the cheese. Start by cutting some fresh greens. 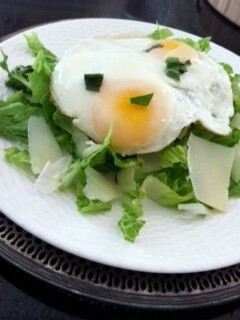 I like Romaine as it maintains a crunch when topped with something warm like eggs. Add some shaved white cheese. Top with two fried eggs. I fry mine in bacon fat, as everything is better with bacon. To get the perfect fried egg heat a pan on medium. Add enough fat (bacon fat, butter or olive oil) to coat the bottom. Then, once the fat is melted, add your eggs. Turn down the heat to medium-low. Check the eggs in 2 minutes. If they are mostly cooked with a little bit of uncooked whites, then cover with a lid or foil. Turn off the heat. Let the eggs sit for a minute. Check, if the whites look fully cooked then you’re done. If not, cover for another thirty seconds. Top with salt, pepper and a dash or two of lemon. Sprinkle fresh chopped herbs. Basil & tarragon work wonders. Pour a glass of bubbly and enjoy!